Community, up to a point: Rosemary Waugh reviews Gecko’s new work on being ‘wedded to society’. The Wedding by Gecko. Photo: Richard Haughton. Gecko make the figurative literal. ‘Living out of a suitcase’; ‘working in a box,’ or – especially in the case of their latest production – being ‘wedded to society’. The trick to watching Gecko is to slip unquestioningly into their world the way you slip unquestioningly into a spinning world of white dresses, soppy toasts and tiered cakes after the fourth or fifth glass of prosecco. The metaphors, images and repeated movements ebb and flow, overlapping and part-disintegrating. It’s a subconscious space, the half-asleep space where the answers to cryptic crosswords pop up at 3am and, correspondingly, the distance between language and image blurs as words and pictures keep changing places. As suggested by its title, there is a lot in The Wedding about ritual and tradition: the pearly gown, the smashing of a glass underfoot. There’s also the repetition of the same events occurring, with repeated visitors entering the wedding dress shop and interchangeable office workers bent over interchangeable desks. The patterns of bodies on replay and repeat start to resemble part of a nature documentary with undulating lines of wildebeest trampling the earth to one beat or a Pixar images of hundreds of insects in close-up all carrying their body weight in seeds. The interest here, however, is not in mass conformity but in the cracks that appear in this imperfectly fused whole. Like with Missing, Gecko’s earlier work, The Wedding hinges on the promise – or threat – of internal thoughts being out of sync with surface perfection. Its tension relies on the potential for a seemingly average individual – a Lily in Missing or a Sophie in The Wedding – to act out. To do a bit of a Winston Smith, if you will. There’s a lot of talk about ‘community’ and the importance of it. In an almost perfect example of nostalgia (the word literally meaning a longing for home), there’s always someone ready to describe how in the past our sense of community was ‘so strong’, how we used to exist in supportive bubbles cruelly popped by modernity. But as anyone who grew up in a small-town will tell you, tight-knit communities are often not the idylls people from larger, urban areas imagine them to be. Communities, with societies above them and families below them, are full of double edges. For every bit of support and loyalty, there is judgement and pressure to conform. The Wedding captures this stifling bind of tradition and community perfectly by choosing as its central metaphor the white wedding. Even the fact someone thought to name it ‘The Happiest Day of Your Life’ encourages suspicion, it seeming more like a command than a genuine reflection. Weddings fill people with dread as much as joy: terror at being unable to afford the correct dress/suit/chair coverings, horror at being judged too fat/thin/frilly/slutty as they parade down the aisle, and panic at trying – and inevitably failing – to manage the expectations of relatives and guests. And that’s before we get to the imbedded traditions such as the bride being ‘given away’ by her father. Amit Lahav’s creation is a brilliant rush of all these feelings, revealing both the intoxicating beauty of the unstained princess dress and its vindictive underskirt. But the real cleverness of the piece is how it doesn’t let those in tulle and silk revel in their select melancholy for long. There is, the piece demonstrates, such privilege in opting in or opting out of tradition and society at will. Not all the characters on stage are trying on gowns, not all of them are ‘wedded to society’. The three people ‘living out of a suitcase’ in particular are not part of proceedings, even when they want to be. The group of people surrounding them – the crowd so interested in the lives of those about to cut the cake – are disinterested when asked to, say, place one euro in the man’s cup. Community, it seems, falls apart when it’s most needed and could most make a difference. The Wedding, then, is about wanting to run from your own party – but it’s also about the people who didn’t get an invite in the first place. 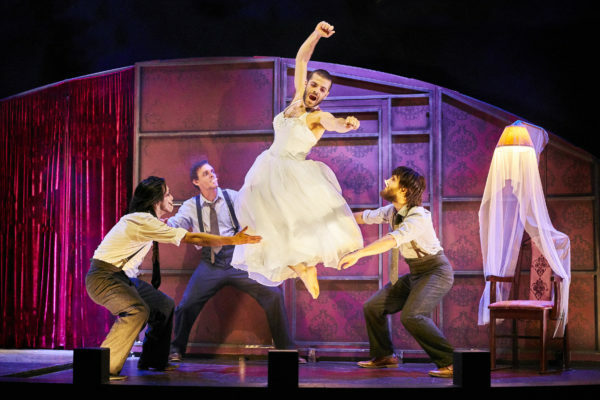 The Wedding was on at the Bristol Old Vic until 20 February. It is now touring until 9 March 2018. Click here for more details.